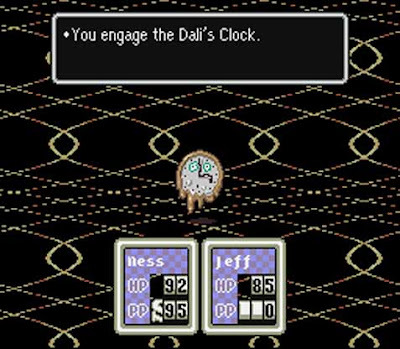 Consider this a sequel of sorts to the post about Flying Omelette's catalogue of video game oddities. 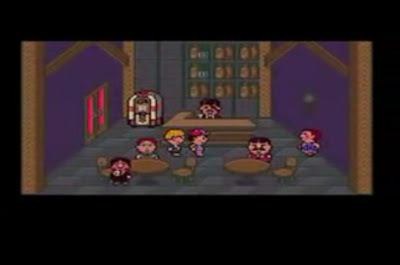 In its list of alcohol-related content in games that should have been as dry as Utah, Flying Omelette does point out the strangeness of Jackie's Cafe, a location in the video game Earthbound. 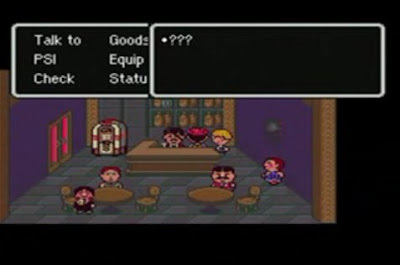 Upon close inspection, Earthbound's programmers clearly designed Jackie's Cafe to be a bar: the spot still features a collection of booze bottles on the back shelf as well as a character who looks a lot more like a bartender than a barista. 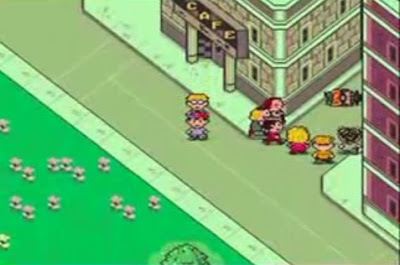 I suppose I would have noticed this immediately had I played the game when I was older. inside: boozy barflies... drinking coffee? 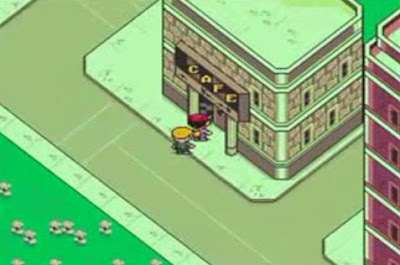 Aside from that small difference between the Japanese version of the game and its apparently teetotaling American counterpart, I noted something even more interesting about Jackie's, for it serves as gateway of sorts into Moonside, a backwards version of the world in which the rest of the game takes place. 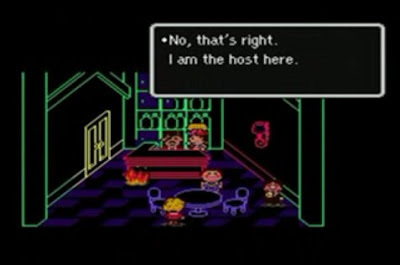 After entering and exiting the bar for the first time, the characters encounter Mr. Everdred, a character from earlier in the game. True to big city life, Everdred has been konked on the head and left lying in the street. 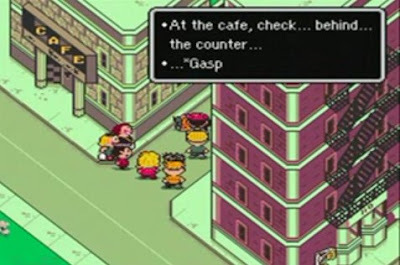 In classic last moment gasps, the seriously injured Everdred babbles about an evil statue and then implores the player's characters to head back into Jackie's and check the shelf — a request even a novice player would interpret as the method of best advancing the plot. Upon checking the shelf out, the screen flashes white and the heroes find themselves in the weirdoland that is Moonside, where flashing neon outlines of buildings replace the structures themselves and where people speak in crazy backwards talk — "left" is "right," "yes" is "no," among a few other things. (Yes, I'm thinking of the Chuck Klosterman opposites discussion again.) Also, strange enemies like ambulatory gasoline pumps and floating Salvador Dali paintings populate the streets. 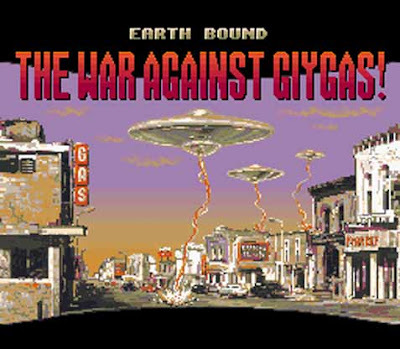 Like I said, major weird, though I suppose not all that much weirder than the rest of the game, which also has the heroes fighting a demonic circus tent or a pile of barf. What struck me as even more notable about Moonside, especially in the sense of pop culture intersections, was the manner in which these events parallel those in the opening segment of the Twin Peaks movie, Fire Walk With Me. 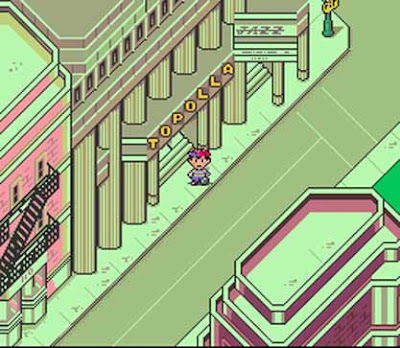 Strip away Earthbound's purposefully 8-bit-esque graphics and occasional puerile sense of humor and you'd be left with a rather surreal plot about evil lurking in a contemporary American setting. In Fire Walk With Me, Agent Chet Desmond — the Agent Cooper stand-in played by Chris Isaak — investigate the murder of diner waitress Teresa Banks, a sort of proto-Laura Palmer. Teresa's body turns up noticeably missing a certain ring she was known to wear in her livelier days. At the very end of his segment of the film and before the film changes to focus specifically on Laura, Chet finally finds the ring beneath Teresa's trailer and reaches out to grab it. Just as he does, the screen flashes white — to a reality in which Agent Desmond has vanished, presumably away from the normal world and to Twin Peaks's flip side, where red velvet curtains serve as walls and creepy midgets speak backwards and malicious dopplegangers attempt to overtake their good-intentioned twins. 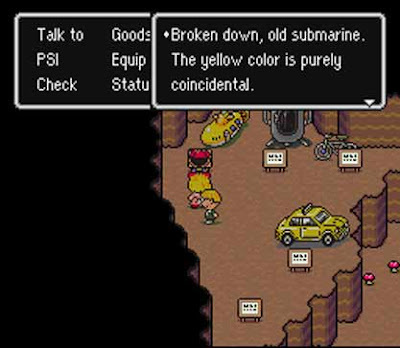 The kicker for all this is that Earthbound's Moonside trip had already risen to prominence, at least in my mind, to the point that it served as the inspiration for "The Freaky Tiki," my final project for Dr. Sorapure's Flash animation class. Essentially an abstract music video, the project detailed strange goings-on in a city — including glowing buildings — that ultimately prove to be the product of an evil statue. The tiki at the end of the video represents my best effort at re-creating the statue Everdread mentions in the game. The funny part is that I don't think I ever processed the similarity between the Moonside sequence and Fire Walk With Me, despite the fact that I actually use a quote from David Lynch in the video itself — "I want to dream when I go to a film." — and that the video used Funki Porcini's very Lynchy song "Sixteen Megatons." ... and the Apollo Theater. 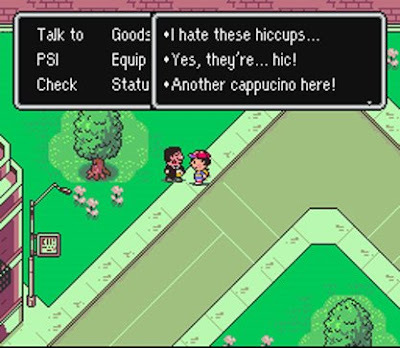 So at least the game covers enough ground of the pop culture landscape that a Twin Peaks reference wouldn't be completely implausible. All images from FlyingOmelette.com, save for the ones I got from this YouTube clip. Ah! It's a scary hallway monster!